The Cockcroft Institute (CI) is a partnership between the Universities of Lancaster, Liverpool, Manchester and Strathclyde, and the Science & Technology Facilities Council (STFC). The core membership comprises the accelerator physics & engineering groups of the partner universities and the Accelerator Science & Technology Centre (ASTeC) of STFC at Daresbury Laboratory. The Institute was proposed in September 2003 and officially opened by the UK Minister for Science, Lord Sainsbury, in September 2006. 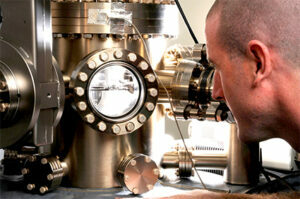 It is located at Daresbury Laboratory and is adjacent to the Daresbury Innovation Centre. The Scottish Centre for the Applications of Plasma-based Accelerators (SCAPA) at the University of Strathclyde provides a complementary set of experimental facilities to those available at Daresbury. The Institute is named after the Nobel prizewinner Sir John Cockcroft FRS. Born in Todmorden in north west England, and educated in part in Manchester, he is regarded as the pioneer of modern accelerator research. The CI is the de facto national centre for accelerator R&D in the UK, and with its very strong university supported backbone closely coupled to ASTeC, comprising just over 200 academics, professional accelerator staff, post-doctoral research associates, administrative staff and PhD students, it is probably the largest of its kind in the world, delivering world class R&D in RF based systems and novel methods of acceleration with major contributions to the realization of national and international accelerator facilities. The CI’s cross-cutting applications programme allows this expertise to be used to address global challenges in health, security, energy, manufacturing and the environment, and to train the next generation of accelerator experts in areas where there is a recognized international skills shortage. We also inspire school students and the general public through our extensive public engagement programmes. The Institute provides the intellectual focus, educational infrastructure and the essential scientific and technological facilities for accelerator science and technology research and development, which will enable UK scientists and engineers to take a major role in innovating future tools for scientific discoveries and in the conception, design, construction and use of the world’s leading research accelerators for the foreseeable future. It not only designs, build and operates new accelerators but also carries out a broad based R&D programme on the fundamental science and technology which underpins conventional and novel particle acceleration techniques. From its founding, the Cockcroft Institute has fostered interaction between University and National Laboratory research communities, with colocation of the CI university researchers at Daresbury National Laboratory, alongside their counterparts in ASTeC. The close interaction between academic researchers and students with the professional engineers and scientists of ASTeC has benefitted both communities. ASTeC and the CI University partners have distinct but overlapping remits. Whilst the university partners are principally driven by scientific and engineering excellence, as judged by academic metrics, ASTeC is directed by STFC accelerator strategy towards enabling delivery of large-scale accelerator facilities. The distinction in remit is reflected in the funding mechanisms, with the university programmes funded through grant income. ASTeC is funded by, and responsible to, the National Laboratories directorate of the STFC. While remits and funding are separate, at the boundary between long-range fundamental accelerator science and the development of underpinning science and technology for the next generation of internationally leading accelerator facilities, the research programmes are complementary and mutually beneficial. There is co-operation between the CI and ASTeC at the management level, with the CI management committee including ASTeC senior management members. ASTeC representatives contribute expertise and give advice on university programmes and on opportunities within the wider STFC strategy. ASTeC and the CI Universities actively collaborate on a number of programmes, and in areas of overlap ASTeC staff contribute to the supervision of post-graduate students. ASTeC receives the benefit of additional academic input into the programmes, while the University partners benefit from access to the large-scale infrastructure and multi-disciplinary teams within ASTeC. In the current/near future programme, CI Universities will have significant engagement with ASTeC through the UK FEL programme, and the development of the CLARA FEL test facility. There will also be significant collaboration with ASTeC in the Novel Acceleration programme, jointly exploiting the VELA, CLARA and laser infrastructure of ASTeC to provide internationally leading demonstration of new acceleration concepts. The Cockcroft Institute strategy can be downloaded here: The Strategy of the Cockcroft Institute August 2015.